Stoppard’s time-bending play mostly impresses. The British playwright John Osborne, whose play Look Back in Anger changed theatre in England, encapsulated Tom Stoppard’s propensity for bloviation best when he dubbed his Czech-born countryman “the thinking man’s laxative.” Considering the most overcooked of his works sheds light both on Stoppard’s immense intelligence, which exceeds the level most of we lowly theatergoers could hope to obtain, and his penchant for crafting plays that tease an audience’s brains rather than their hearts – or even their nether regions. 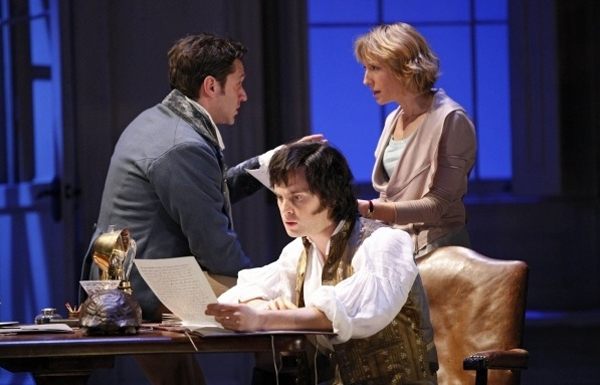 Arcadia, one of Stoppard’s finest plays (it can be found in revival on Broadway through June 19th), both defies and exemplifies his usual aforementioned pitfalls. Simultaneously thrilling and perplexing, it’s a play where Stoppard’s intellectual tricks find some theatrical payoff. Unlike in the unruly Coast of Utopia trilogy, Stoppard’s cross-generational experiments in juxtaposed narratives result in some thrilling stage business. When the play begins to hint at real emotion or romance is when its flaws begin to show. The central narrative of the play revolves around writer Hannah Jarvis, an expert on an English estate called Sidley Park, and an academic named Bernard Nightingale, who seeks her out in the hopes of enhancing a talk he’s giving. As they proceed in sharing their separate knowledge, a plot begins to unravel in the past. Was the poet Lord Byron a visitor to Sidley Park in the early nineteenth century? And how did his possible presence there affect the lives of Septimus Hodge, a tutor at the home, and his young charge, Thomasina Coverly, whose relations still inhabit the house in the present day? The play is set entirely in the garden front room of the house, a long wooden table set at center stage around which all of the action of the play unfolds. Props and, on occasion, costumes enmesh between the time periods. Only rarely do scenes occur simultaneously in the nineteenth century and the present, and one wishes there were more moments of shared discovery in the text. Still, it’s a thrilling idea of Stoppard’s and one that keeps we as audience members interested to know what comes next as the play switches between the past in the present. At the heart of this production are our present-day leads, the radiant British actress Lia Williams as Hannah and Billy Crudup as Bernard. The two make an appropriately steely pair, alternating between spiky jibes and unexpected attraction. Meanwhile, in the nineteenth century, Tom Riley is gripping in the role of Septimus Hodge, the learned tutor who finds himself not only mentoring Thomasina Coverly (the appropriately shrill Bel Powley) but also, at the same time, enrapt by her progress as a pupil. Raul Esparza, always a pleasure on stage is fine in the role of Valentine Coverly, one of the present-day Coverly inhabitants of the house, despite an underdeveloped romantic subplot between he and Hannah, and some of the play’s supporting players, namely Margaret Colin as Lady Croom and Grace Gummer as Chloe Coverly, Bernard’s underwritten young love interest, seem to be scratching at the surface of their characters rather than embodying them, though for certain Stoppard’s cursory drawing of these roles is at least partly to blame. The thrill throughout Arcadia lies in watching the mysteries of the past unravel as they actually occurred and yet viewing these occurrences as new discoveries in the eyes of the play’s twenty-first century characters. Fortunately, David Leveaux’s fluidly time-bending direction mostly succeeds in fulfilling Stoppard’s vision for the piece in this revival. There are still moments of alienation here, as when Stoppard (because, really, it’s his voice we hear during these overlong speeches) expounds on the history of English gardens or goes off on a tangent about thermal energy. Still, on the whole, most audience members willing to keep up with the characters’ verbosity should be captivated. Where the play’s success is more debatable is in the moments when its intellectual fervor, which is so thrillingly intricate, gives way to its more emotional moments. Though Arcadia’s central mystery enthralls, the romances therein can’t hope to compete and so, when they take the forefront, they fizzle and ultimately affect the production’s overall success.